There are around 20 million hectares of agroforestry (Figure 1). Close to 90% of the European grassland area could include silvopasture practices and more than 99% of the European arable land could have silvoarable practices. These figures show the huge potential of agroforestry in Europe. Most of the current agroforestry practices are placed in the south of Europe (Map 1) and that most of the agroforestry practices are silvopastoralism (Figure 2) (Mosquera-Losada et al.2016). Figure 2: Current percentage of agroforestry practices in Europe (Multipurpose silvopasture means silvopasture with fruit trees and Multipurpose silvoarable means silvoarable agroforestry practice with fruit trees) (Mosquera-Losada et al. 2016). Mosquera-Losada, M.R., Santiago Freijanes, J.J., Pisanelli, A., Rois, M., Smith, J., den Herder, M., Moreno, G., Lamersdorf, N., Ferreiro Domínguez, N., Balaguer, F., Pantera, A., Papanastasis, V., Rigueiro-Rodríguez, A., Aldrey, J.A., Gonzalez-Hernández, P., Fernández-Lorenzo, J.L., Romero-Franco, R., Lampkin, N., Burgess, P.J. (2017). 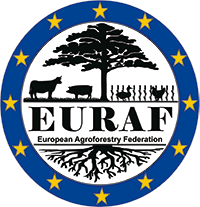 Deliverable 8.24: How can policy support the appropriate development and uptake of agroforestry in Europe? 7 September 2017. 21 pp.